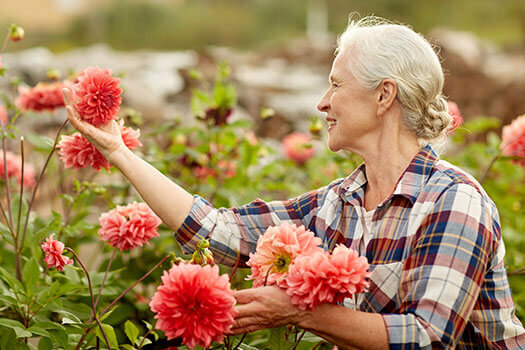 Spending time outdoors can enhance a senior’s mental and physical health, and gardening can be a wonderful hobby for older adults with varying levels of mobility. Gardening is inexpensive, doesn’t require too many supplies, and it can be done practically anywhere, from a large plot of land to a small balcony or patio. Here are some reasons to encourage your senior loved one to take up gardening. Adults over age 60 tend to experience more stress than other age groups. Fears about their health, finances, independence, and their loved ones’ wellbeing can add unnecessary worry to their lives. Multiple studies have shown that gardening can relieve stress and anxiety. Being outdoors in the sunshine boosts mood and reduces the levels of the stress hormone cortisol. High levels of cortisol often lead to high blood pressure and high blood sugar. Gardening is just one of the many ways older adults can boost their health and wellbeing. Seniors who want to remain healthy as they age can benefit in a variety of ways when they receive professional home care. Winnipeg, MB, Home Care Assistance is here to help your loved one accomplish daily tasks, prevent illness, and focus on living a healthier and more fulfilling life. Gardening requires some physical activity, which is great for seniors who need to exercise more often. By the time your loved one has planted a few rose bushes or rows of tomato plants, he or she has probably built up some muscle strength and experienced a little cardiovascular activity in the process. For many people, staying active is the key to slowing the aging process. If your loved one grows a vegetable garden, he or she can enjoy the healthy produce without breaking the bank. A pack of seeds usually costs between $1 and $3, and it can provide enough of a single vegetable to last for weeks. For seniors who live on fixed incomes or don’t always have access to fresh healthy produce, gardening can encourage them to eat a more balanced diet. Many seniors feel as if they no longer have an impact on the world around them. However, planting and growing a successful garden can make seniors feel more useful. Your loved one may feel a sense of pride and self-esteem as he or she watches vegetables grow or as the landscape turns from drab to beautiful. Sharing veggies with friends, making a family dinner with homegrown tomato sauce, or taking a bouquet of freshly cut flowers to a friend in the hospital may help your loved one feel useful. Regular socialization can also boost your senior loved one’s self-esteem. For families living in Winnipeg, respite care can be a wonderful solution when their aging loved ones need companionship and socialization a few hours a week or just need minor assistance with daily household tasks. At Home Care Assistance, we thrive on helping seniors maintain their independence while living in the comfort of home. Studies have shown that soil contains some friendly bacteria. When the body is exposed to certain bacteria, it can help the immune system fight against everything from seasonal allergies to psoriasis. When working in the sun, your loved one will also soak up extra vitamin D, which is a must for strong immunity. From tending to their gardens to managing basic household chores, seniors may need assistance with an array of tasks. Aging adults who need help around the house, transportation to medical appointments and social events, and assistance with exercise can benefit from having an in-home caregiver. With the help of Home Care Assistance Winnipeg, seniors can enjoy greater independence and receive regular mental and social stimulation when relying on a trusted professional who is expertly trained in various aspects of senior care. To schedule a free in-home consultation, give us a call at (204) 489 6000 today.